kalel fan The game is made for people who can actually watch movies, not for children as the last rater suggested. 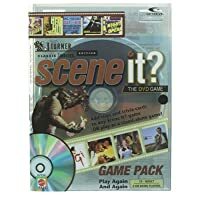 It is NEVER advertised for children in the original Scene It game. If they cannot watch a rated R film, then they should not play Scene It in the blue box. The game works great at parties and for self play. DrummerT33k My son need this for a college organation party. He needed it to be delivered in 3 days. It was delivered in 2 days. I really appreciate the service that I always get when I order from Sears. Lori12765 The DVD worked well with our existing Scene It? Junior version. However, some of the questions and clips were somewhat "suggestive" and do not seem appropriate for children under 18. Also, the questions asked were not for children that young to answer because they would not have had the exposure that adults would. This game is more for adults, not children. 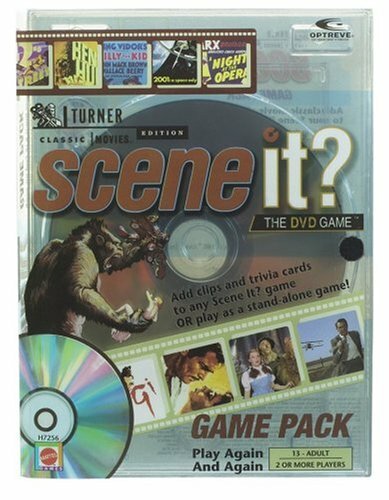 DVD Game Pack Box set contains DVD from full TCM game (with scenes & images of 180 movies and 700+ on-screen trivia challenges), plus 96 Trivia Cards, 4 reference cards, 1 die - ages 13+ for 2 or more players, 30 minutes (short play), Requires a DVD player, TV & remote control.